At Concept we strive to make your life easier. Whether you are a Financial Adviser, an existing member of one of our pension schemes, or, a potential future member of one of our pension schemes, we are constantly looking for ways to improve efficiency and simplify affairs. We understand that pensions are highly complex, and as such, they can appear a bit daunting and we hope that by providing you with relevant, useful tools and information you will feel more at ease with managing and maintaining your pension, or that of your clients. We aim to provide you with up to date, accurate information so that you remain “in the loop” when it comes to relevant and notable industry news. Such information can be viewed via our company Twitter and LinkedIn pages, which provide you with relevant industry articles as well as helpful tips and our own company news. A constant feed is also provided under the news section of our website. Concept has developed a simple to navigate tool, the “Pension Finder”, to enable you to find the most suitable pension product to meet your own (or your clients’) retirement needs and objectives. 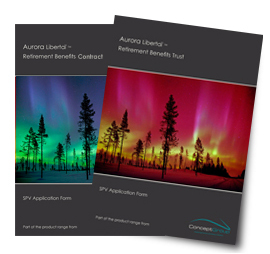 Simply select the most appropriate response to each of the questions, for your own (or your clients’) individual circumstances and retirement objectives, and the Pension Finder will determine the most suitable Concept Aurora pension scheme that meets the personal circumstances and retirement objectives stated. The Retirement Calculator is a quick and easy pension’s calculator that provides an indication as to the amount that an individual should be contributing, whether regularly or as a one off lump sum, in order to have a sufficient amount in their pension at retirement to provide them with their desired level of income. The Retirement Calculator will help to identify any potential shortfall based on current fund value and level of contributions, allowing advisers and clients to make informed decisions about ongoing retirement planning and where necessary, make additional provisions to address any shortfall. The Retirement Calculator has been designed for indication purposes and should only be treated as a guide. The Retirement Income and Funding Calculator can be found within the IFA login area of our website, and provides a more detailed evaluation of your client’s future retirement position. Essentially it will provide a detailed and comprehensive overview of what level of contributions is required in order to receive the desired income upon retirement. Technical guidance notes are issued frequently and are designed to help improve the understanding of our product offerings and the potential benefits of these, as well as any current and relevant technical fundamentals that may be affecting the industry. Currently you will find a selection of technical guidance notes that cover topics from updates on French taxation to a piece on Trust Vs Contract and the suitability of each structure. If you wish to obtain a copy of our product literature, generic forms and fee schedules you can now logon to our IFA login area rather than having to contact us directly. Help us to help you by completing a contact us/request form. We will be more than happy to answer your questions at a time that suits you. If you feel that there is a topic that could be further explained as a technical guidance note, let us know and we will do our best to upload this to our website. You can also request on site training by simply filling in this form. This information is provided for general information only, Concept does not provide financial, legal nor tax advice, and nothing in this document should be construed as such. Concept shall not be held responsible for any liability or loss arising directly or indirectly from any reliance placed upon the content of this document. Concept recommends that all individuals should seek their own appropriate advice. Following an agreement between HM Revenue & Customs (“HMRC”) and the Government of Guernsey, HMRC have agreed to make available a disclosure facility – the “GDF”. The GDF is available from 6 April 2013 until 30 September 2016 and has been introduced to help UK taxpayers with investments in Guernsey to apply the terms of the facility to regularise their UK tax affairs with HMRC. By coming forward under the GDF they may be able to take advantage of a number of special terms. Concept Group Limited (“Concept”) is now able to offer individuals a choice of either trust or contract based on personal retirement benefits schemes. Both contract and trust based personal retirement benefits schemes are approved under the relevant law in the jurisdiction from which the scheme is established and managed. How do they both work? It is possible to establish and manage a personal retirement benefits scheme in a number of different forms, although, arguably, the most widely used and recognised in personal pension provision has been through the use of a pension trust. It is commonplace for multi-member personal schemes, such as a large proportion of UK based Self Invested Personal Pensions (“SIPP’s”) and Qualifying Recognised Overseas Pension Schemes (“QROPS) around the world, to use a ‘Master Trust’ and individual Sub-Funds are then created for each individual scheme member in order to provide segregation. It is also possible to replicate this arrangement using a contract based scheme, which still allows for a multi-participant personal scheme with the individual Sub-Funds. Concept has ensured the segregation of funds is achieved through holding the assets within an individual Cell of a Protected Cell Company (“PCC”) referenced to an individual’s Sub-Fund. The schemes have been developed in order to ensure that an individual scheme member, (of a trust based personal scheme) and an individual participant, (of a contract based personal scheme) will be entitled to the same lifetime and death benefit options. In simple terms this means that both types of schemes offer largely the same benefits. The primary differences arise in the ongoing scheme management and administration. These differences are considerations primarily for the trustees or principal parties of the trust or contract based schemes and will have little if any direct effect on the individual scheme member or participant. So when might a contract personal retirement benefits scheme be better that a trust personal retirement benefits scheme or vice versa? Concept has learned through its significant experience in the international pensions industry that, generally, the concept of a trust arrangement is not understood and/or not formally recognised in many civil law countries and as such membership of a trust based personal scheme can sometimes result in complex and onerous discussions between an individual scheme member and the relevant tax authority within the civil law country in which the individual scheme member is resident. Therefore it is possible that for individuals resident in certain civil law jurisdictions, in which the concept of a trust is not necessarily understood or may not be formally recognised in local law, that a contract based personal scheme might be considered as an alternative as this may remove the uncertainty in the relevant jurisdiction and simplify the ongoing affairs and obligations of the individual. Examples of civil law countries or territories include; Austria, Belgium, Bulgaria, China, Czech Republic, Denmark, France, Germany, Greece, Italy, Latvia, Netherlands, Poland, Portugal, Russia, Spain and Switzerland. Several jurisdictions are now introducing legislation specifically targeting the use of offshore trust arrangements and are not necessarily differentiating or exempting a personal pension trust, a recent example of this is France. The legislation being introduced often requires detailed and onerous reporting of the interests and assets held within the trust to be declared to the relevant local tax authority in the individual’s country of residence, which ca, in turn, result in additional charges being levied by the Trustees for the additional time spent and work involved in preparing and submitting the necessary reports. Failure to report and meet the deadlines to report can also often result in punitive charges being due on the member and/or Trustees. As a contract based personal scheme does not utilise a trust, it may potentially be that these legislative amendments and reporting obligations being introduced in certain jurisdictions will not apply to this type of scheme. An individual should always seek to take appropriate independent, specialist financial and tax advice prior to the establishment of any personal retirement benefits scheme to ensure the suitability of the scheme for their individual circumstances. The advice taken should take into consideration the country or territory from which the personal retirement benefits scheme is going to be managed, the country or territory in which the individual is and/or will be resident, and if applicable the country or territory from which the relevant transfer of pensions benefits and/or contributions are to be made. Should you wish to learn more about any of the retirement benefits schemes that Concept is able to offer, or require introductions to suitably qualified specialist financial and/or taxation advisers, please contact a member of our Sales & Marketing team who will be able to assist. This and other technical guidance notes can be found within the Concept IFA login area. The media undoubtedly plays a vital role within society, providing up to date and relevant information to the masses. However as the old saying goes; with great power comes great responsibility. The media has a responsibility to ensure the validity of the information they put out into the public domain. The responsibility of the media to ensure the accuracy of the information they publish is even greater when the topic being discussed may potentially influence the future financial planning of an individual in respect of arguably their single largest personal asset – their pension scheme. On the 3rd October 2013, Money Marketing published a “Technical Quiz” with a number of questions focused on the recent 2012 revisions in the QROPS legislation and specifically in regard to delisted QROPS. Such topics are certainly worthy of coverage within relevant industry journals, as it is likely there are still a number of individuals who may have previously transferred their UK accrued pension benefits into a now former Guernsey QROPS who are unsure how the legislative changes might impact their position. But the very least that should be expected of such a publication, when providing information that many individuals will likely rely upon, is to ensure the information being communicated is factual and correct. Unfortunately in this instance, this was simply not the case. The answer that Money Marketing initially provided to this question was A. This suggested that any individual who had transferred their accrued UK pension benefits to a Guernsey QROPS, that was no longer a QROPS post April 2012 due to the revised legislation introduced by HMRC, would need to transfer out of the scheme within a three year period or else they may be liable to suffer “member payments charges” as a result. This is 100% incorrect and entirely contradicts the information that was provided by HMRC at the time that confirmed that any individual who was an existing member of a Guernsey QROPS, that was no longer a QROPS following the revised legislation, would be able to continue to receive their pension benefits from the scheme in the same manner and would not be at risk of any member payment charges as a result of the scheme no longer appearing on the HMRC QROPS list. These extracts have been taken from the FAQ’s of the Pension Schemes section of the HMRC website (http://www.hmrc.gov.uk/pensionschemes/20120307-faqs-template.pdf) and more recently the revised technical guidance notes within the RPSM (Registered Pension Scheme Manual). “5. What will happen to a member’s pension savings in a QROPS if the scheme doesn’t meet the conditions to be a QROPS from 6 April 2012? If a pension scheme that is a QROPS on 5 April 2012 no longer meets the conditions to be a QROPS on 6 April 2012 members of the pension scheme will be able to remain as members and receive a pension paid from the sums transferred without incurring member payment charges. Such an erroneous and factually incorrect statement within what was labelled a “Technical Quiz” could well result in any individual in this position seeking to transfer out of their existing Guernsey scheme in order to avoid suffering the suggested consequences of member payment charges that the article clearly suggests would be incurred as a result of an individual not transferring away from such a scheme within a three year period. Money Marketing has since amended its answer from A to C.
Unfortunately once again they’ve provided misinformation. The correct answer to the question is, in, fact D.
Any individual who was a member of a Guernsey QROPS prior to April 2012, that is no longer a QROPS as a result of the legislative revisions that were introduced by HMRC, can continue with the scheme and the administrator will have no ongoing reporting obligations to HMRC. Generally the administrator of a delisted scheme has a one off obligation at the time of formally delisting, to report on mass for all existing Members and once this report has been made there is no further ongoing reporting obligations to HMRC. Therefore the message that existing members of such a scheme should be receiving is one of reassurance. They are in fact in arguably the best possible position they could be, with a pension scheme that has the ability to pay gross income (for non-Guernsey resident scheme members) and has no ongoing reporting obligations to HMRC. In light of the above, you would have to question what motivation might there be for existing members of such a scheme to transfer out of the scheme and into a listed QROPS? It could be argued that existing members should NOT be seeking to transfer out of their current scheme, regardless of the fact that it is no longer listed as a QROPS. Transferring to another scheme could result in their pension income becoming taxable, in line with the relevant tax laws of the jurisdiction to which the scheme had been transferred, and would also result in the new scheme administrators having ongoing reporting obligations to HMRC. This would be in addition to any charges the transferring scheme and receiving scheme may charge the Member for closure and establishment respectively.